"Don't apologize. It's a sign of weakness." Stars: John Wayne, Joanne Dru, John Agar, Ben Johnson, Harry Carey Jr. When John Wayne and John Ford were in their primes, they turned out some of the most entertaining Westerns ever to hit the screen. 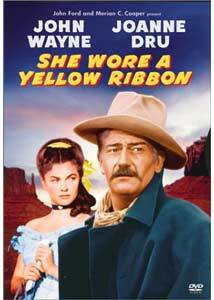 She Wore a Yellow Ribbon, second in their acclaimed "Cavalry Trilogy," is one of the very best of these. Capt. Nathan Brittles (Wayne) is only six days from retirement from the cavalry when word of the downfall of Custer at Little Big Horn hits. Emboldened, the local Indians begin making plans for war. The commanding officer of the fort orders Brittles to take his wife Abby (Mildred Natwick) and niece Olivia Dandridge (Joanne Dru) out on patrol to the next outpost so that they can take a stagecoach to safety. But disaster follows disaster as the Captain's service draws to a close and he fights to redeem himself. There's not much more in the way of entertainment one can ask from this picture. There's plenty of action, romance that doesn't feel tacked on as an afterthought, and comedy relief that's actually pretty funny. Despite being primarily a tough-guy picture, there's also a ton of sentiment, and Wayne's farewell to his men will hardly leave a dry eye in the house. Wayne turns in one of the best performances of his career here, despite being saddled with some exceptionally poor age makeup. He provides a character that's fully rounded with not only heroism but sensitivity and above all, caring about the men under him. The character is well-written too, taking numerous steps to protect the safety of the men under his command, and deeply ashamed at his failures. The various characters, in the supporting cast are usually interesting as well. Among these are the two men competing for Miss Dandridge's affections, Lt. Ross Pennell (Harry Carey Jr.) and Lt. Flint Cohill (John Agar) are entertaining in their conflict and immaturity. Oscar�-winner Victor McLaglen has a comic turn as Quincannon, the hard-drinking Irish sergeant who intends to follow Brittles into retirement. The picture is loaded with juicy character bits for them as well as many others, including Chief John Big Tree as the elderly Pony That Walks, who cannot persuade the fiery young men of his tribe to live peaceably. As usual, the picture is beautifully shot in Monument Valley. The cinematography by Winston Hoch won an Academy Award�, and it was well-deserved. It's drop dead gorgeous throughout; one just wishes that Cinemascope had been invented five or six years earlier to really capture the vistas here. The score by Richard Hageman is alternately stirring and moving, relying heavily on folk songs but adapting them deftly for the demands of the sequence. It's highly appropriate and effective and adds a great deal to the presentation. Image Transfer Review: The original full-frame picture is generally quite attractive. The Technicolor is often eye-popping, with dazzling colors and breathtaking sunset shots. A few of the moments with the most intense reds (and there are quite a few) have a bit of smearing that's rather surprising. There's also some mild ringing in particularly high-contrast moments. The storm sequences are rather dark and lacking in detail. Part of the problem is a stingy bit rate that hovers around 3 Mbps. At that rate it's surprising it looks as good as it does, with some very nice detail and texture present. I'm surprised that a film as important as this, in which visuals are so vital, wasn't deemed worthy of an RSDL disc to allow for more in the way of bits. Yet there is plenty of beauty present and most of the damage has been digitally repaired so that there's only an occasional speckle. However, in chapter 26 a hair apparently got onto the frame of the magenta strip, since it's quite red and annoying. I wouldn't have minded digital erasure of that artifact. Audio Transfer Review: The audio track hasn't been cleaned up too much; there is still a fair amount of noise and hiss audible throughout. However, the dialogue comes through clearly at all times. The music is predictably thin and lacking in low bass, but sounds decent for the era. Extras Review: The extras are fairly scant. The John Ford home movies are supposedly shot during location scouting, but they're mostly quite dark and illegible. Optional subtitling to indicate what's being shown would be advisable here because as it is it's fairly inexplicable, though there is a candid shot of Wayne drinking beer. A list of cast and crew accompanies an essay on the pictures that Ford and Wayne did together, along with a listing of those films. Wrapping up the package is a slightly pink trailer that as usual makes the film proper look fabulous. One of the finest Westerns ever made, in an attractive presentation. A bit light on extras, and an RSDL disc with a higher bitrate would have been nice, but an important addition to any collection nonetheless.